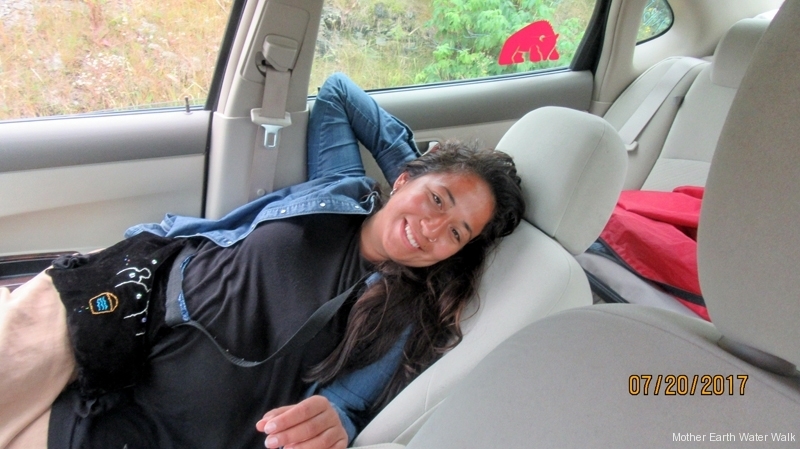 Josephine Mandamin: Lake Michigan here we come! Word is being put out for Waterwalk Supporters to complete the circumference of Lake Michigan. 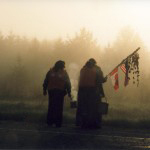 As many of you are well aware, in 2004 the Waterwalkers blazed through the state of Michigan following the tracks of our ancestors and walked around the upper half of the shore of Lake Michigan. Once the lower half is completed, then the Waterwalkers can say we have walked around all the Great Lakes. Challenges are met with great honor especially when we know it is for a deep purpose; – the betterment of all, especially our Mother Earth. The Water Walk’s mission to raise awareness about humanity’s need for water has not been heard south of Lake Michigan. It is important to keep our waters clean to ensure the everlasting use for our grandchildren and their grandchildren. Our water is not for sale. This message will be carried this spring. The Lake Michigan Waterwalk 2008 will start at Manistee, Michigan on Saturday, April 26, 2008. At sunrise, the plan is to offer Feast Foods to the Water, Pipe and Tobacco and then start walking after the petitioned water and pail has been filled. Then we’re off to Ludington and on the Muskeegan. Our next stops will be Holland, Benton Harbor, Michigan City and Chicago. Our greatest challenge will be Chicago. We hope not to get blown away by this windy city!! After a long break from Chicago, our next stop will be Waukegan and Milwaukee. It is our hope to pass through Wisconsin in four or five days. Our home stretch will be Escanaba or Hannaville, again, as our last journey. It is with great anticipation to end the Lake Michigan Walk by May 6th or 7th. So all you Michigan folks, Illinois, and Wisconsin folks, get your walking shoes shined up. We are coming!! 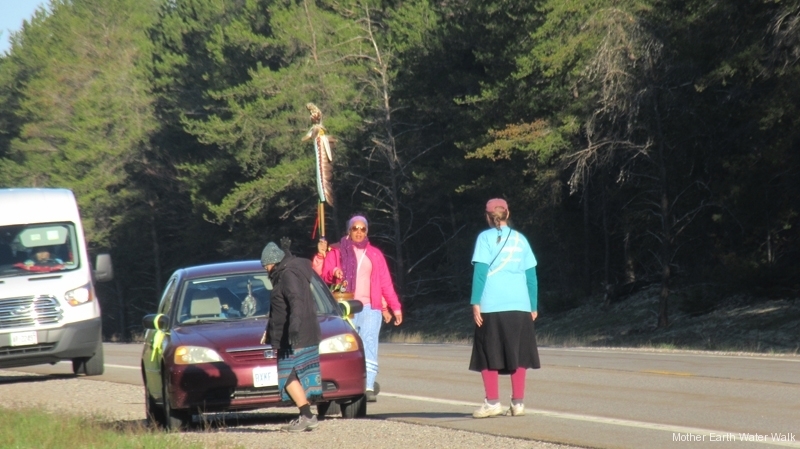 Elizabeth Caldwell Bissell: Two Anishinawbe Grandmothers, and a group of Anishinawbe Women and Men have taken action regarding the water issue by walking the perimeter of the Great Lakes. 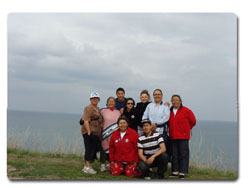 Along with a group of Anishinabe-que and Supporters, they walked around Lake Superior in Spring 2003, Upper Lake Michigan in 2004, Lake Huron in 2005, Lake Ontario in 2006, Lake Erie in 2007 finishing with Lower Lake Michigan 2008. 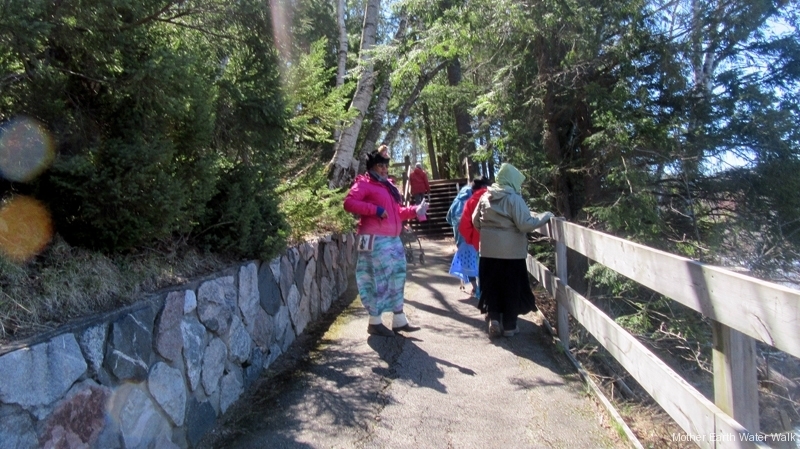 The 1st Annual Women’s Water Walk took place April 2003. Several women from different clans came together to raise awareness that our clean and clear water is being polluted by chemicals, vehicle emissions, motor boats, sewage disposal, agricultural pollution, leaking landfill sites, and residential usage is taking a toll on our water quality. 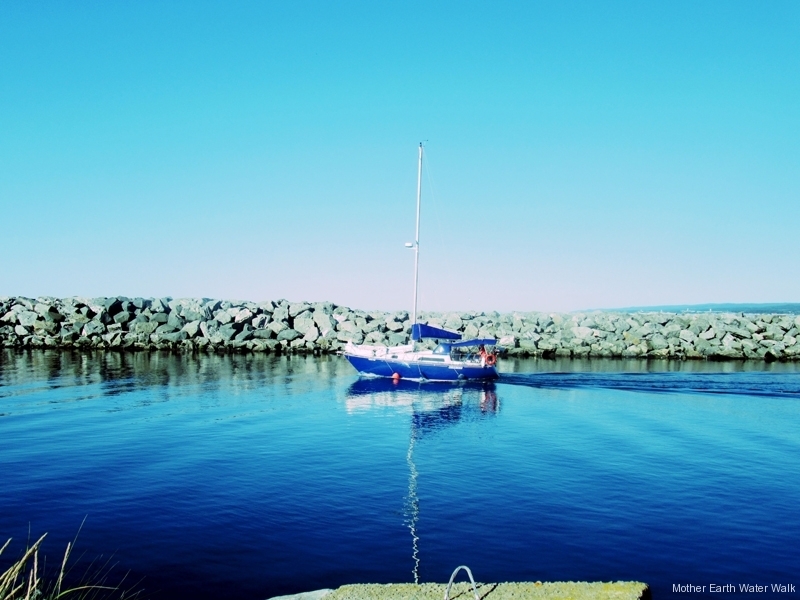 Water is precious and sacred…it is one of the basic elements needed for all life to exist. The Annual Women’s Water Walk was chosen for Spring because for the natural re-growth of our natural habitat, as it is a in time for renewal, re-growth, and re-birth. A team of 6 – 8 Aboriginal people volunteer to walk and help with the everyday necessities such as having multitasked drivers to accompany walkers, food preparation, refreshment breaks, camp set ups, cleaners, laundry etc. Public Relations Personnel have been involved throughout by taking shifts, and also going ahead to communities to aid with the awareness of the walk. This includes the distribution of media releases, posters, pamphlets, advertisements, and meeting and greeting of the participating walkers. The overall result after implementation is to gather other groups and/or organizations to participate in an all regional walk around the Great Lakes. The goal is achieved strength in numbers with other Aboriginal men/women in the Great Lake Regions. The anticipated outcome is to have all people aware of the importance of the water and gain support and the gathering of other supporters whom would share an interest in protecting our water through our walk. This event will be annually, with the intent of the Women’s Water Walk to gain awareness and support for annual walks throughout the region. This will entail support, recognition, and awareness of the importance of keeping Great Lake waters clean. It is the hope that other locals, individuals and organizations will come together each spring to spread interest and awareness in their communities to care and protect the waters of the earth from further pollution. This annual event is intended to gain support and to raise awareness throughout the region. The originality of this idea is uncommon as there are few who are ready and willing to take on such a challenge. This idea is original because of how society today is taught to rely on the technological equipment, and that the mere thought of a walk being more than 15 minutes is a task for many. We strive with determination in that this challenge is seldom being done elsewhere, particularly in our region. We are doing this walk to emphasize the importance of our waters. The Great Lakes are very precious and sacred to our being, as water is one of the basic elements needed for all life to exist. We are seeking donations to help the walkers offset the cost of the travel expenses. Make donations payable to Mother Earth Water Walk c/o Melvina Flamand. Local Ludington Contact: Elizabeth Caldwell-Bissell 231-845-1951. The Little Boy Water Drum has travelled around three of the Great Lakes. He has sat and shared his song teachings with the many different tribes that live along the waters. The walks may be finished but this year there has been so much publicity that, hopefully, it has made more people aware of our concerns in relation to the water. It feels good to be on the Road home, I can hardly wait to see my grandson, but I will miss walking and meeting different people. We will go home and rest a little while and then get ready to leave for the Three Fires Spring Ceremonies.